As a child, I was fascinated by puffins, among many other exotic seafaring animals. (Exotic, meaning, I had never seen them in the forests of West Virginia.) My kindergarten teacher read us a book on seabirds, and puffins enchanted my young heart. The Atlantic puffin (Fratercula arctica) in the book she held up was small, fast and colorful, she explained. They could be found in several places I had never heard of, including a magical land called Scotland. (My five-year-old self may have added the magical bit. At that age, the presence of castles equaled magical.) I imagined myself sitting among these tiny birds, in a place where green and blue met. Atlantic puffins reside in coastal colonies during breeding season, tunneling cliffside burrows of offshore islands to lay a solitary egg. It is during mating season that Atlantic puffins sport their signature brightly colored beaks. During breeding and rearing in spring and summer, they can be found in their clifftop colonies on several Scottish Isles, including East Lothian, the Inner and Outer Hebrides, Fife, Shetland and Orkney. Breeding pairs typically return to the same burrow location each year. The puffin parents take turns caring for the egg and chick. Eggs hatch in about six weeks, and rearing takes about two months. Atlantic puffins chiefly eat small fish and sand eels. They are also known to consume mollusks, crustaceans and marine worms. Parents can often be seen flying prey from the sea to burrows to feed their young. 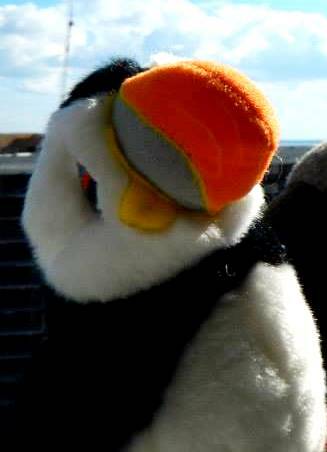 Atlantic puffins are preyed on by larger seabirds, such as hawks and skuas. If enjoying puffin watching in one of their habitats, it is important to keep from approaching too closely, so as not to stress puffin parents. (They may still fly right by you, or even nestle in near your watching spot!) It is also important to not go too close to the cliff’s side, as you could cave in their burrows and hurt or even kill the puffins inside. Burrows are commonly two to three feet long (70 to 110 cm). Bring your camera and binoculars—I could watch puffin behaviors for hours!—and you can still get great photos, even from a distance. Notice as they bill, in which mating pairs rub their bills together, to a curious crowd of fellow puffins who gather to watch the public display of affection. You could catch gaping behavior, in which they puff up and open their wings and beak to show aggression. They may also stomp their feet to show discontentment. You may also notice nosy neighbors popping in to check out different burrows. Atlantic puffins live in the northern Atlantic Ocean, spending winters at sea. They can be found from Greenland to the coastline of Newfoundland and from Norway to Spain. Their large range has helped the species to remain abundant, although the IUCN reports the population trend appears to be decreasing. 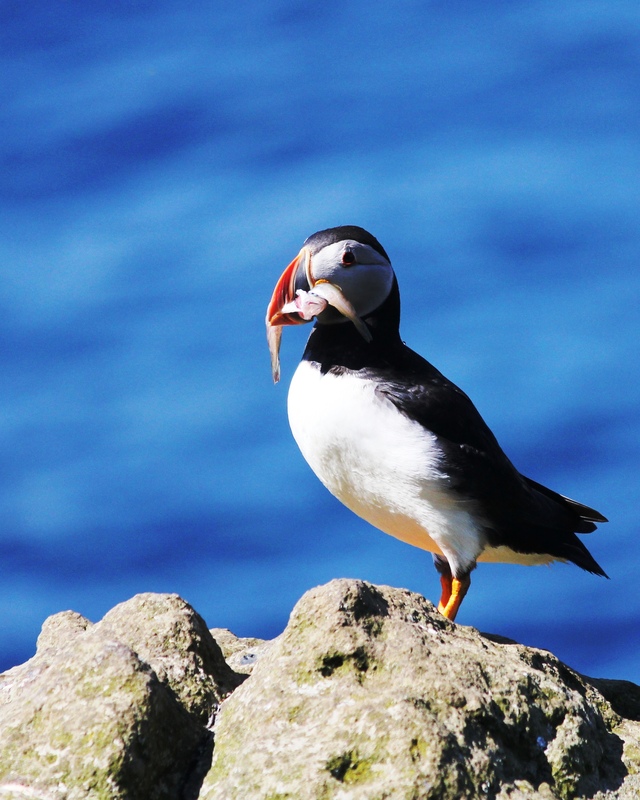 Local populations in some areas have declined due to human activity, including puffin hunting, over-fishing of their prey items, invasive predator species, oil spills and drilling operations. The Atlantic puffin is the mascot for the 3rd International Marine Conservation Congress. The mascot is aptly named Alan MacPuffin. 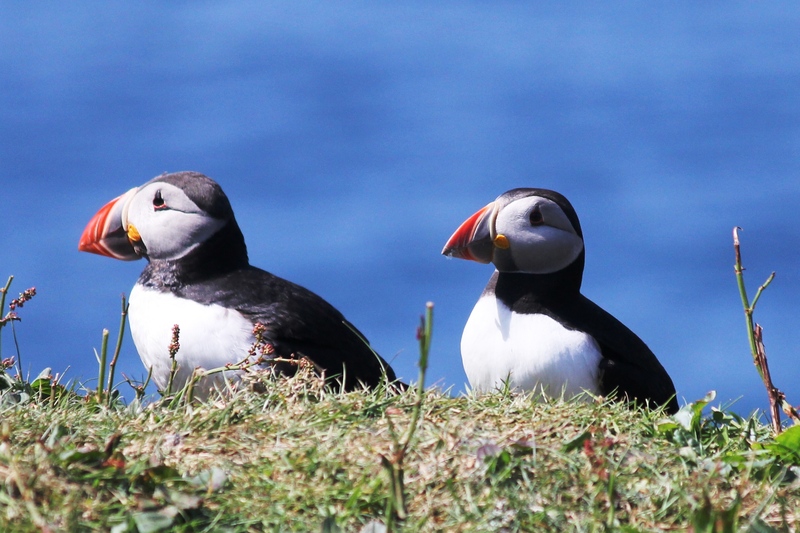 Atlantic puffins leave their colonies throughout August, so if you are extending your Scotland travel for IMCC3, you may be able to catch these captivating seabirds before they depart from the Scottish Isles for the year. -Samantha Oester is a co-chair and the communications chair for IMCC3.